Austria-Hungary (the “Dual Monarchy”) was a dualistic state, which was created after the constitutional reform of the Austrian Empire in 1867 and existed until 1918. Before World War I, after which it collapsed, the Austro-Hungarian Empire encompassed the entire territory of today’s Austria, Hungary, Czech Republic, Slovakia, Slovenia, Croatia, Bosnia and Herzegovina and some parts of today’s territory of Italy (South Tyrol, Trieste, part of Friuli, part of Carinthia and Carniola), Romania (Transylvania), Serbia (Vojvodina), Montenegro (Bay of Kotor), Poland and Ukraine (Galicia, Bukovina). We invite you to explore part of this monarchy with us. The route will lead us through the biggest and most beautiful cities. In twelve days we will visit six countries, six major cities and other touristic attractions. Reception at Vienna Schwechat Airport. Transport to the city was we will pass through the Austrian OMV refinery. Evening tour of the capital city of Austria will include a panoramic drive through the 5.2 km long round-abound- Ring that surrounds the Vienna Town – Inner Stadt. The famous psychoanalyst Sigmund Freud walked around the Ring daily however, we will drive through it. 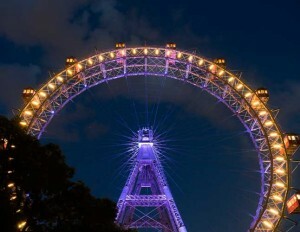 We will see UNO City (Vienna International Center), rotating wheel in the Prater park, the Austrian Parliament and much more. Dinner will be served in one of the restaurants with the famous Viennese steak (surcharge). Hotel accommodation and overnight stay are included. Stroll along the cites promenade, Kдrntner StraЯe until the church of St. Stephen. 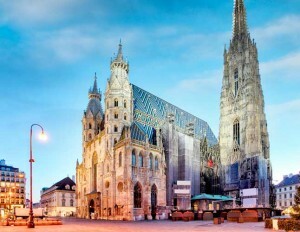 We will visit the most famous Viennese cathedral, a Gothic jewel and continue walking down the street Graben all the way to the entrance of Hofburg palace, which also hosted emperors of the Habsburg dynasty. In the area around the Albertina museum complex, we will have time for lunch. Afterwards, we will taste the most famous Viennese delight – Sacher cake. We’ll continue our stroll towards the Vienna opera, Maria Theresa market, city hall which was built in the neo-Gothic style and much more. 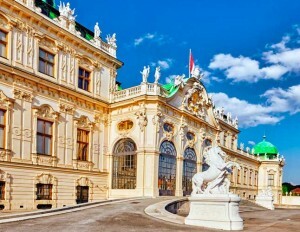 In the afternoon, we will visit the summer residence of the Habsburgs – Schцnbrunn Palace. The Baroque palace is listed on the UNESCO World Heritage List. Overnight stay is included. After breakfast, we’ll depart in the direction of the Czech Republic. 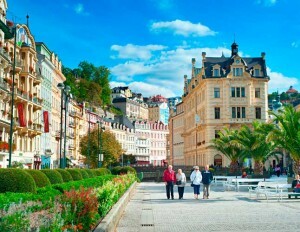 In the afternoon we will arrive at Karlovy Vary, pronounced Carlsbad in German language, one of the most famous spa towns. It was founded already in the second half of the 14th century. 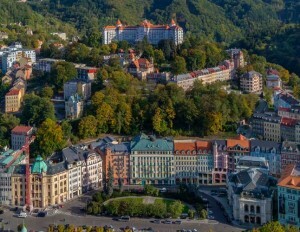 Here they have discovered 13 main springs of thermal mineral water and since the 19th century, Karlovy Vary has become the most popular tourist destination of VIP’s throughout Europe. The city is also known for its film festival and liqueur »Karlovy Becherovki” which is manufactured since 1807. We’ll have the opportunity to taste this bitter green-yellow liquor later in the evening in one of the restaurants in town, where we will have dinner. Overnight stay is included. After breakfast, we will depart to Prague, the capital city of the Czech Republic. It is also called “Golden Prague”, the city of a hundred towers. Viewing of the city will begin at Hradcany, the huge castle complex, where we will visit the St. Vid Cathedral and the Royal Palace. 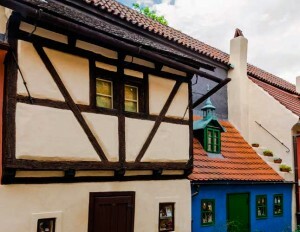 Of course, we will not miss out to visit the famous Golden Lane, where famous writer Franz Kafka created his work. We will have lunch in the district of Mala Strana. Afterwards, we will stroll through the Charles Bridge dated from the 14th century, one of the oldest stone bridges in Europe. The bridge is decorated with statues of saints. St. Nepomuk who was thrown into the Vltava river. If the weather conditions are favorable, we will board a boat and sail down the river. Famous Czech composer Bed?ich Smetana dedicated the symphonic poem called My Homeland to Vltava river. Dinner will be in one of the famous Czech pubs where we will have the opportunity to taste a pint of excellent Czech beer, a beverage that is drank more than anywhere else in the world. Hotel accommodation and overnight stay are included. After breakfast, we will visit the Jewish part of the city Prague – Josefov and we will see the Old-New Synagogue with its cemetery. 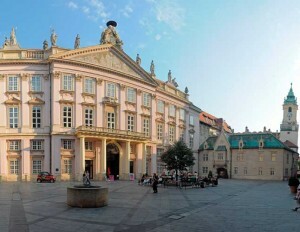 We will walk to the Old Town Square which is famous for its old town hall, its astronomical hour dated from the 15th century, the monument to the Czech reformer Jan Hus and the Tyn church. Wenceslas square is where the Czech history took place and it is recognizable after the Vaclav monument, the Czech king, and saint from the 10th century. In the square, we will see the memorial monument where a Czech student Jan Palach committed suicide because of the political protest against entering Warsaw Pact armies into Czechoslovakia in January 1969. Overnight stay is included. 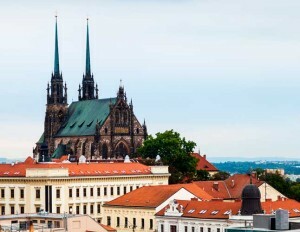 After breakfast, we’ll visit the second largest Czech city Brno, where we will visit the capital of Moravia, once a historic province of the Austro-Hungarian Empire. Before that, it was a part of one of the first Slavic countries, the Great Moravia. It was named after the river Morava and its name is of Slavic origin, meaning water and wetlands. We will climb to the fortress of Љpilberk, which was for centuries a prison for enemies of the Austro-Hungarian Empire. Today, it is a museum. Over the city, there are two majestic church bell towers Peter and Paul, dated from the 14th century. At the Jacob Church in the center of the city, there is a small man showing his bare buttocks to the by passers. We will visit the vegetable market with Parnasovim Fountain, a baroque palace Dietrichstein and much more. Moravia is also known for its excellent wines, especially those from white wines vineyards. In the evening hours, we will departure to the capital city of Slovakia, Bratislava. Hotel accommodation and overnight stay are included. After breakfast, we will climb to the castle hill where Bratislava Castle stands and from where the Celts controlled the trade route and its passage over the river Danube. The last major renovation of the castle was commissioned by the Habsburg Empress Maria Theresa in the 18th century when the castle was renovated in a Baroque style. In the city we will visit the majestic cathedral dedicated to St. Martin in which, during the time of the Turkish occupation of Budapest, the Hungarian kings were crowned. 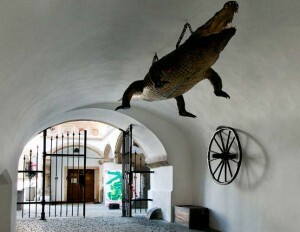 We will walk under Michalovб tower, the only surviving medieval gate that leads to the city. We will continue our stroll to the main square with Renaissance Roland fountain. We will enter in the classicist Primasovo (archbishop) palace, where in 1805 “Peace of Bratislava” was signed after the defeat of the monarchy against Napoleon. On the route of the old town, there are two exhibited sympathetic statues to warm up the atmosphere, such as the beautiful Naci, Napoleonic soldier, ?umil and others. 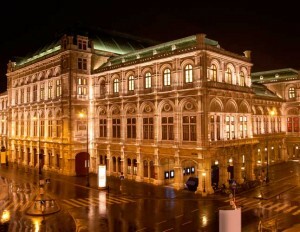 We will also see Mozart’s palace, where the famous composer as a child had one of his first concerts. The Slovak National Theatre (Divadlo-theater) was a creation of the Viennese architectural company Fellner & Helmer, which also designed a number of buildings throughout the Austro-Hungarian Empire at the end of the 19th century. We will see a monument dedicated to Danish storyteller Hans Christian Andersen, who in 1840 visited Bratislava, where he got the inspiration for the fairy tale “The Ugly Duckling” and “The Little Match Girl”. In the late afternoon, we will drive to Budapest. 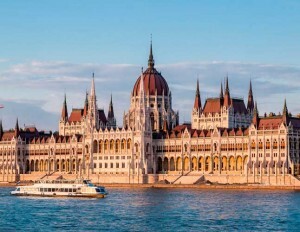 The Hungarian capital is also called beauty along the Danube river, mainly because of the picturesque location and grand architecture, that gives it a special touch to the golden era of the city in the second half of the 19th century. Hotel accommodation and overnight stay are included. After breakfast we will visit other sights, particularly interesting covered market, the magnificent St. Stephen’s Cathedral and if the weather conditions are favorable, we will take a boat ride from the Margaret Island and pass through all the important bridges, the facades of Parliament and the famous Citadel. 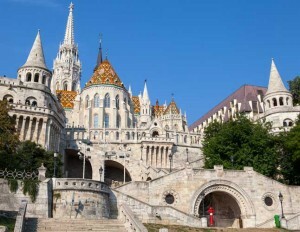 We will drive across the chain bridge on the castle hill where there are a Mathias church, Fishing fortress and castle palace, with a beautiful view of Budapest. In the afternoon, we will devote some time to visit the old town and the famous Vaci Street, which is considered the heart of the city. There will also be some free time for you to buy souvenirs and explore the city. We recommend dinner, music and dancing in the traditional Hungarian restaurants called “?arde”. Overnight stay is included. Zagreb, the capital city of Croatia. After breakfast, we will drive towards Croatia. The path will lead us through the picturesque Hungarian Lake Balaton, the largest freshwater lake in Central Europe. After crossing the Hungarian border with Croatia we will leave the Pannonian Plain, which is the residue of the ancient Pannonian Sea and drove towards the hilly Croatian Zagorje. We will stop for lunch. In the late afternoon, we will arrive in Zagreb. The tour of the capital city will be in the evening hours. 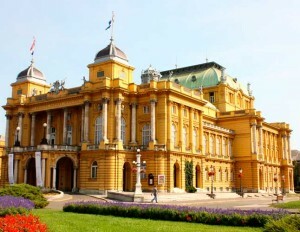 The National Croatian Theater is a Neo-Baroque art building built by the Viennese architectural company Fellner & Helmer which we already had a chance to see in during our journey. We will stroll down the flowering park Zrinjevac, which is a popular promenade with its pavilion and a number of wells. King Tomislav monument will remind us of the 10th century when Croatia had important military and political role in the whole region. We will end our walk at the main square, Ban Josip Jela?i? Square. Dinner will be served in one of the restaurants in the picturesque Tkal?i?eva Street (surcharge). Hotel accommodation and overnight stay are included. Morning tour includes a walk through Donji grad until Kaptol. We will see the Cathedral, the largest church in Croatia. Zagreb Cathedral or the Cathedral of the Assumption and St. Stephen’s Cathedral and Ladislav that all together form archdiocese of Zagreb. Its bell towers are staggering 105 meters high. We will see the Upper Town, Bloody-bridge, Stone Gate and St. Mark’s Square. In the city tower Lotrљ?ak, built in the 13th century, stands a hilltop cannon which, for more than a century, marks the midday with a bang. We will descend to one of the longest and most prominent streets in Zagreb – Ilica. We will continue our journey towards Slovenia, where we shall arrive in the late afternoon. Hotel accommodation, evening stroll through Ljubljana, time for dinner and overnight stay is included. After breakfast, we will drive to Postojna. We will visit the largest and most beautiful karst caves in Europe, Postojna Cave. Guided tour of the cave includes walking and driving with an attractive cave train, where you will be able to admire 5 kilometers of tunnels, passages and spectacular halls. 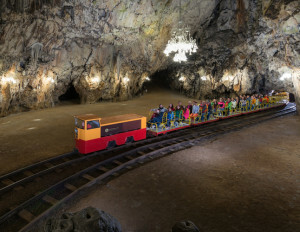 After visiting the cave we will continue our journey to Bled, the pearl of Alpine Slovenia. Driving with “pletna” a sort of gondola, which will take us to the island in the middle of Lake Bled, where there is a wonderful church. We will have the opportunity to try the typical local dessert, “kremљnita” (cream slice cake). 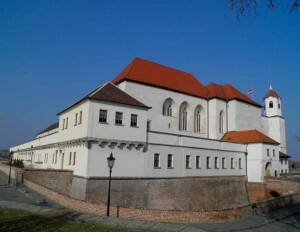 We will visit a castle which is more than 1000 years old and is the oldest one in Slovenia. The castle stands at 130 meters high cliff above the lake. If the weather is nice we will enjoy the view of the Alps and Triglav which is the highest Slovenian mountain. Afterwards, we’ll return to Ljubljana, where we will visit Preљern Square, Triple Bridge, Town Square with the baroque fountain, the Town Hall and cathedral Church of St. Nicholas. 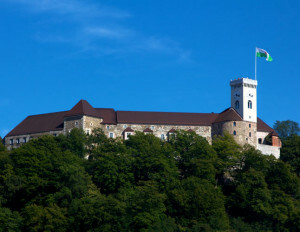 We’ll climb to Ljubljana Castle, which offers a beautiful view of the entire city. 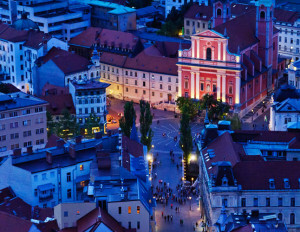 Ljubljana has won the prestigious award for the European Green Capital 2016. Overnight stay is included. Transfer to Vienna Schwechat Airport is included. 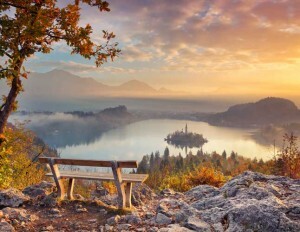 Includes: Pick up at the Zagreb Airport, transfer and all needed transportation, guided tours, 11 Hotel accommodations and overnight stays in double rooms (served with breakfast) in 3 or 4 * Hotels, entrance fees to: St. Stephen’s Cathedral, Hofburg palace, Schцnbrunn Palace, Prague Castle – Circuit B, Љpilberk castle, Bratislava Castle, St. Martin cathedral, Matthias Church, Fishing fortress, Postojna cave, Pletna boat ride or dessert “kremsnita”, Bled castle,organization of the journey and English speaking guide. Your private driver is an excellent licensed guide who will guide you through detailed itinerary through former Austria-Hungary locations. Price includes: Pick up at the Zagreb Airport, transfer and all needed transportation, guided tours, 11 Hotel accommodations and overnight stays in double rooms (served with breakfast) in 3 or 4 * Hotels, entrance fees to: St. Stephen’s Cathedral, Hofburg palace, Schцnbrunn Palace, Prague Castle – Circuit B, Љpilberk castle, Bratislava Castle, St. Martin cathedral, Matthias Church, Fishing fortress, Postojna cave, Pletna boat ride or dessert “kremsnita”, Bled castle,organization of the journey and English speaking guide. Your private driver is an excellent licensed guide who will guide you through detailed itinerary through former Austria-Hungary locations.